The 13th Asia Pacific Orchid Conference will be organised in Malaysia for the first time ever and it will be at Kuching, Sarawak. 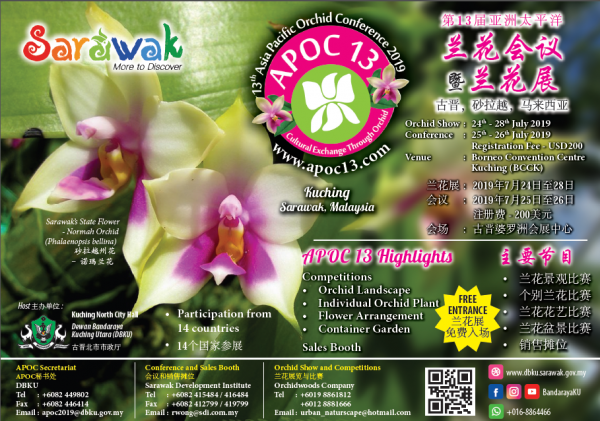 With participation from more than 14 countries, APOC13 is bound to excite you with orchids extravaganza. APOC’s objective is to achieve an international cooperation for trend in development and conservation of orchids in the Asia Pacific Region. An array of interactive programs have been lined up for the APOC13 which include conference, various orchid competitions, exhibition, horticulture, agriculture, and food bazaars, APOC quiz, children drawing / colouring competition, musical bands, orchid run and many more. Whether you’re a fan of local or hybrid orchids, grower, enthusiast, researcher, come and experience one of the most exciting orchid festivals and conferences in the Asia Pacific. See you in Kuching!